This Tu Bishvat, GIFT have run fruit collections, flower planting and educational sessions for hundreds of young people in schools, youth groups and synagogues across London, Manchester and Jerusalem including Yavneh College, Hertsmere, Morasha, Etz Chaim, Rosh Pinah, Immanuel College, Ezra Youth Group, Borehamwood & Elstree Shul, King David Primary & Secondary Schools, Manchester, and YTA, Evelyna and Yehuda Halevi Schools in Jerusalem. Yavneh Bat Chayil group in Manchester participated in an interesting and creative session themed around planting the seeds of their journeys of womanhood. 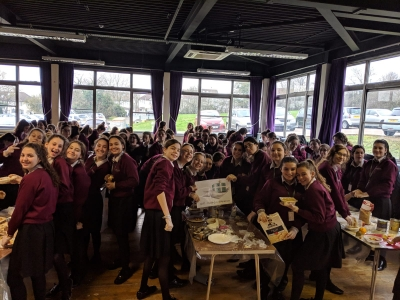 Almost 100 girls at Hasmonean High School participated in a group fruit crumble making session. Noa Gilbert, year 10 told us, “The activity was really fun. It showed me that doing good does not only bring joy and happiness to the receiver but brings joy to me too as the giver. It’s good to know that through this fun activity, my classmates and I put a smile on many people’s faces. I hope to be doing something similar again soon.